Will relives his worst moments over and over, as if he is living in a nightmare. And even though it’s unbearable to watch, Hannibal (the show) forces your gaze to linger as Hannibal (the murderer) kills Abigail again and again. In Will’s dreams Abigail survived and accompanied him on his quest to find Hannibal. She is calm and, subsequently, helps calm him when he’s lost his way in the depths of his imagination. She checks on him when he takes too long at the Italian police station. Her voice brings him back to life when he’s picturing death. But Will is imaging some other world — and in the real world, Hannibal has escaped, Will is still searching, and Abigail has died. I fell for it for a minute, believing Abigail was alive, but I should have known better. The show dabbles in memory and dreams so often and so easily that it's difficult to know what is real and what is not. But Abigail was so broken, she wouldn't have been able to command her life again so quickly after yet another attempt on her life (her poor throat). She, like the teacup Hannibal smashed, wouldn't be put back together. So Will travels to Italy alone — it’s still unclear whether Jack or Alana survived — to continue trying to catch the killer who seems to be more monster than man. When Will arrives at the Norman Chapel, he is not trying to get closer to God, like so many other visitors, but to capture the devil. The chapel continues to elevate the scenery this season. Every set is grander than before, and Gothic architecture is no longer just hinted at in elements of Hannibal's home, it has come into the literal forefront as arches in the church point upward to paintings of saints, and skeletons dance in the floor. Will doesn’t find Hannibal, but he does get closer when he sees the message Hannibal left in the last episode: a body in the shape of a human heart. Will begins work on this crime scene, as he’s done so many times before, by imagining the killer’s motives and methods. And in the most nightmarish part of a nightmare of an episode, Will imagines the heart-shaped corpse unfolding back into the human it once was. The Wendigo’s antlers sprout out of the body, and then the headless, skinless monster crawls toward Will. It is disturbing, it makes no logical sense, and yet it completely belongs in Hannibal’s world. Hannibal this season is like living in a bad dream — one location bleeds into another, people are there and then not there, and time moves forward, and then back again. Every episode is focused on images and feelings; even the words the characters speak sound like lyrical poems instead of actual conversation. When Will meets an Italian investigator, he sounds like he’s telling Will an old folk tale rather than reciting a murder investigation he used to work on. And in a way, it is a folk tale, just like last week was a fairy tale. Investigator Pazzi tells Will of Il Mostro, the monster of Florence who killed people and then used their bodies to depict famous works of art. (Of course Hannibal is a legendary serial killer on at least two continents.) He has been thinking of this case for years, he tells Will, and once he even met the monster himself. It seems like Will is going to make a new friend in Pazzi, but friends of Will's don’t usually survive for long. But maybe together Will and Inspector Pazzi will be able to capture the killer who keeps slipping out of their hands. But can the devil ever be caught? Primavera is not only the name of the painting depicted in Il Mostro’s murder scene, it is also a pasta served with fresh vegetables and means “spring” in Italian. 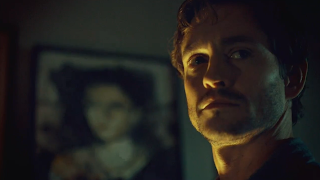 I love that when Will goes to look for Hannibal, it looks like he is looking into the fires of hell underneath the church. Next week I'll be a little late with my review, but I'll still be watching and writing! What was the scariest image for you this episode? For me, it was the arm of the heart-monster growing into a hoof.